Within the Columbus Metropolitan Statistical Area (MSA), Dublin has a strong north-south road network that converges on downtown Columbus. In contrast, the area has an underdeveloped east-west road network, based in large part on the expense involved in bridging the Scioto River. This pattern continues to constrain movement and development within the city. The There have been significant improvements made to the transportation network between 2000 and 2010. These enhancements are reflected in the improved transportation ratings by respondents to the City’s recent Resident Satisfaction Surveys. From 2006 through 2010, between 84 and 87 percent of respondents rated Dublin’s traffic and roadways as excellent or good, (compared to 80.7 percent in both 2004 and 2002, and only 58.7 percent in 2000). 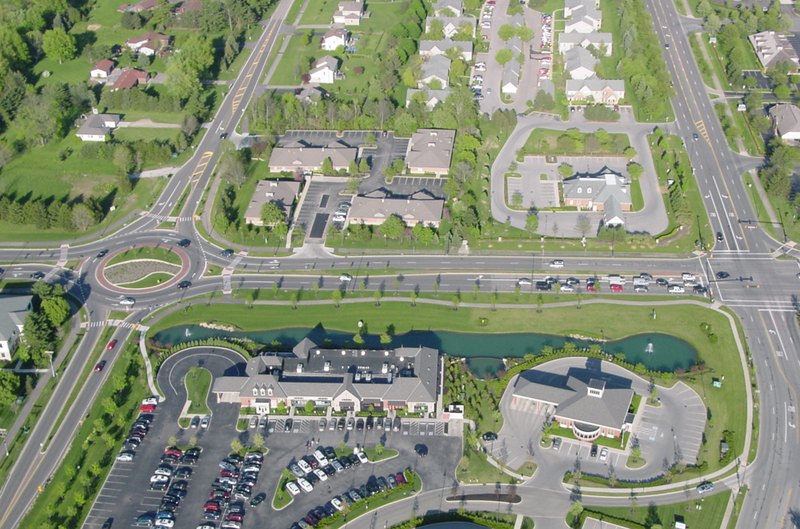 The 2010 survey also indicated 86 percent excellent/good ratings for the ease of traffic flow on the city’s modern roundabouts, compared to 76 percent in 2008 and 74.2 percent in 2006. Although transportation received an “excellent/good” rating in recent surveys, responses also indicate that improvement to the road system remains a priority. 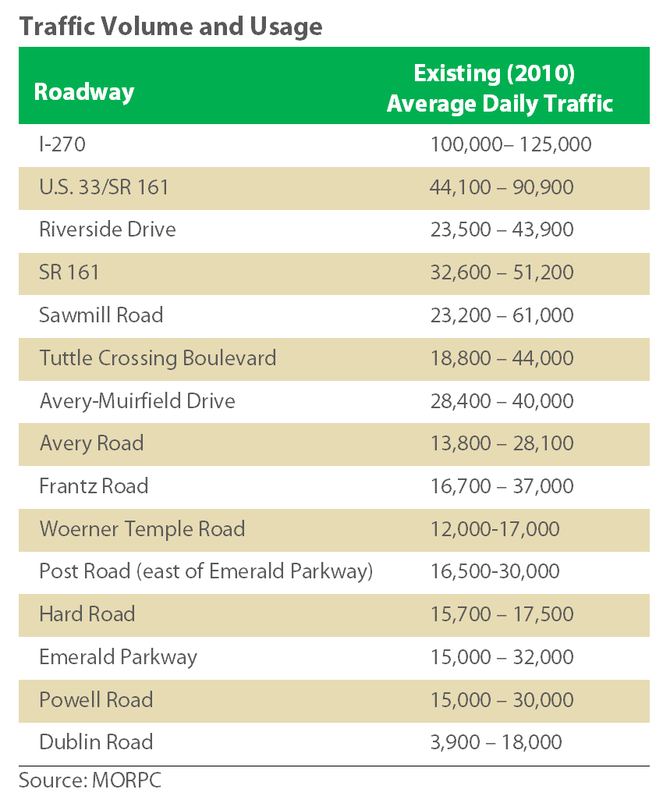 Improving traffic and roadways is consistently indicated as one of the top goals for the community. This chapter outlines existing traffic conditions, traffic volumes, identified capacity problems and planned roadway improvements. A variety of sources of traffic data are used to study Dublin’s transportation system including traffic count inventories from the Ohio Department of Transportation (ODOT); Franklin, Delaware, and Union Counties; the Mid-Ohio Regional Planning Commission (MORPC); and the City of Dublin. These available counts were supplemented with 16 additional targeted inventories that consisted of 11 total weekday traffic counts and five AM and PM peak hour turning movement counts. AM and PM peak hour volumes were defined for all count locations. Collected data was used to validate the Cube/Voyager travel demand computer model developed for the planning process. Please refer to PROJECTIONS for more information on the travel demand modeling process. Riverside Drive (U.S. 33) south of SR 161 to Fishinger Road: scenic character along the River with two lanes of travel and limited left turn lanes. 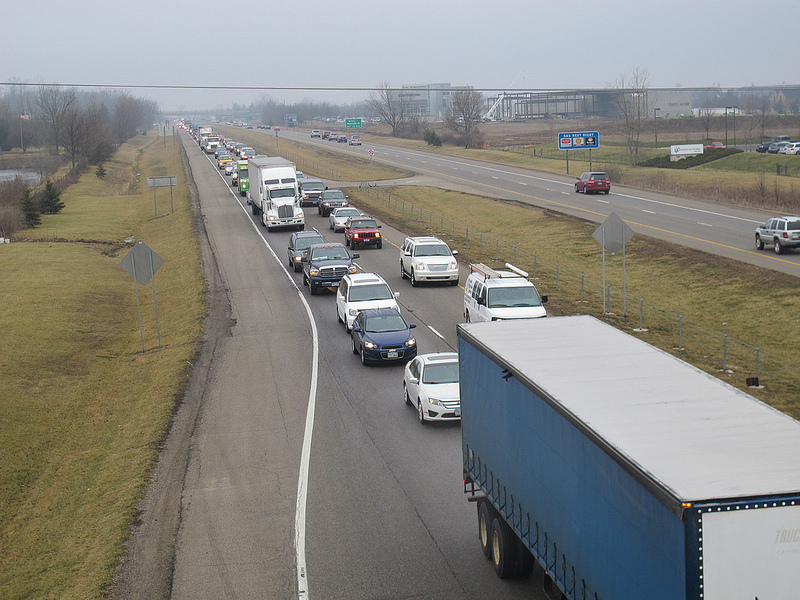 While these capacity problems are primarily experienced during the traditional commuter rush (peak) hours, lunch hour congestion is felt in the areas of Frantz Road, Avery-Muirfield Drive and U.S. 33/SR 161. In addition, extreme weekend congestion and delays are experienced along the Sawmill Road and Powell Road corridors because of the the adjacent retail activity and the Columbus Zoo. Other extreme congestion with stop-and-go conditions are encountered on many weekday evenings (especially Friday) along the I-270 North Outerbelt through Dublin. When this happens, drivers often divert to Dublin’s internal streets, placing an increased demand especially on river crossings. This can create significant delay and congestion across the entire roadway system. 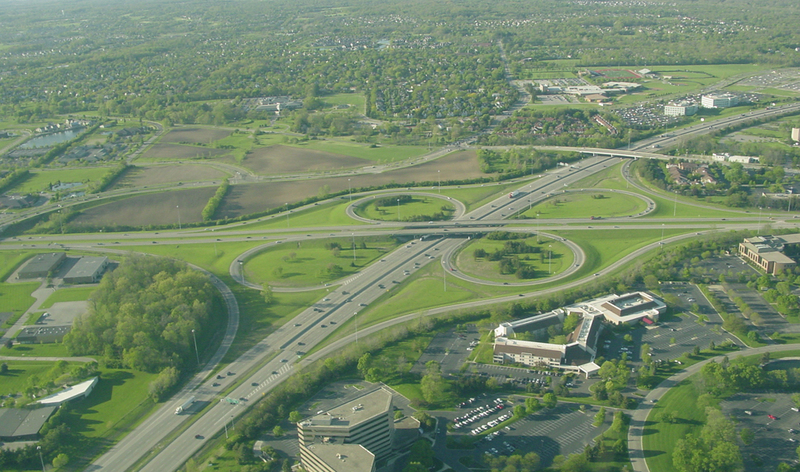 While U.S. 33 and I-270 provide access for trips that start or end within Dublin, they also carry high volumes of traffic through the city. Dublin Road, Riverside Drive, Sawmill Road, Avery Road, and U.S. 33 are also part of the regional road network. 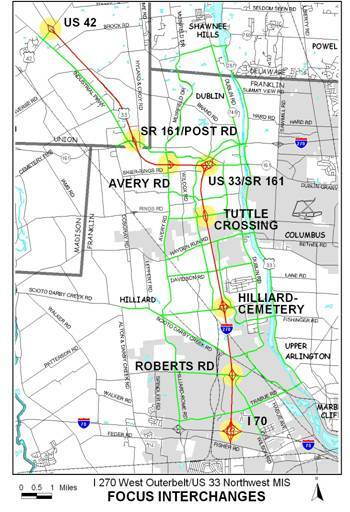 As new developments occur in Union and Delaware Counties, a significant portion of the traffic generated will be attracted to Dublin’s I-270 and U.S. 33 interchanges or other areas along I-270. This regional traffic absorbs a portion of available roadway capacity for the Dublin area. Avery Road widening from U.S. 33/SR 161 interchange south to city corporate line (first phase complete, remaining phases planned). U.S. 33 widening from I-270 to Avery-Muirfield Drive to the outside, creating a four-lane basic roadway section with auxiliary lanes in each direction (planned). 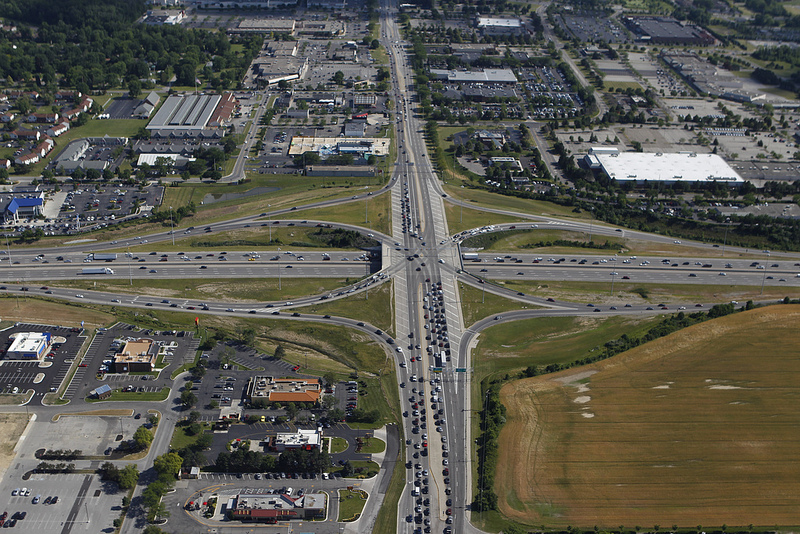 Of greatest regional significance is the planned widening and interchange improvements of the Outerbelt on the northwest side of the greater Columbus area. Congestion along I-270 and U.S. 33/SR 161 is moderate to severe and will worsen as traffic volumes increase over the next 25 years. Two freeway segments currently operate at a Level of Service (LOS) “E” during the PM peak hour: westbound lanes of U.S. 33/SR 161 between I-270 and Avery-Muirfield Drive and the westbound lanes of I-270 between Sawmill Road and U.S. 33. While new development has created thousands of jobs, it has also caused transportation challenges. The I-270 widening projects will assist in relieving the associated congestion with two new lanes in each direction, with auxiliary lanes, planned for the corridor on the northwest side. The new lanes will be outside the existing lanes first, and then to the inside in order to retain the width of the median for as long as possible and to minimize expenses by purchasing rights-of-way earlier. In addition to the freeway widening, several interchange improvements, the I-270/Cemetery Road, I-270/Tuttle Crossing Boulevard, and the I-270/U.S. 33/SR 161 interchanges are all expected in the next 25 years. In particular the I-270/U.S. 33/SR 161 interchange has received priority status by ODOT, with the possibility of construction beginning in the next five years. Additionally, ODOT has identified the U.S. 33/SR 161 interchanges at Avery-Muirfield Drive, McKitrick Road, and U.S. 42 for construction in the future. Timing of these improvements is uncertain given the lack of predictability of transportation funding in the State of Ohio. The City of Dublin actively cooperates with ODOT and other state and federal leaders to advance these important projects. Each of these improvements is necessary even with the widening of I-270 to three lanes in this area; it was clear that this widening alone could not totally solve the mobility problems in the northwest corridor. Added to this is the need for other general improvements to crossroads and other roadways on the surface street system. MORPC is preparing to meet these needs by coordinating regional efforts to manage and reduce the demand for travel through increased transit service and travel demand management strategies that can eliminate trips or change when those trips occur.